While walking the dog and toddler to the park in the gorgeous 64 degree heat yesterday I noticed all of the lawns in my neighborhood were covered by these white patches on the snow. It almost looked like they were left behind after the snow melted. I wasn't sure what they were at first. They looked like spider webs but I doubted they could be fresh as the spiders aren't that active yet and snow would have crushed the delicate webs. People are seeing this all over the Twin Cities. I did a little research and discovered these are Snow Molds. The conditions must be just right this year as it is growing everywhere. Here's a photo of our little back-yard at work. You can see the large pile of snow in the back. 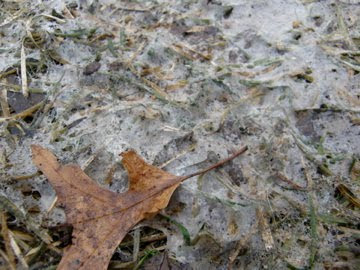 All of the faint gray areas that look like frost on the grass are snow mold. Here's a close up of the mold. The web-like structure are actually the mycelium of the mold which grows on the blades of the grass. It looks like you would be able to pick it off but it is so delicate it essentially vanishes when you touch it. I was thinking this is Gray Snow Mold but there is a Pink Snow Mold as well that looks gray at first and turns color later. 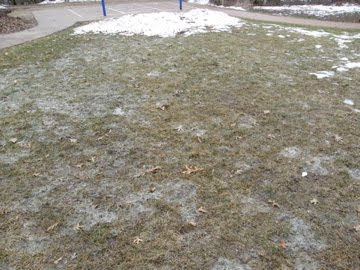 One diagnostic difference is that the Gray Snow Mold forms brownish-orange sclerotia or mycelial masses on the blades of the grass. I looked but could not find any so perhaps this is the Pink Snow Mold. Time will tell. I hope it is not the pink as it tends to cause more damage than the gray. There is more information available on snow molds from the University of Minnesota's Extension Service. Thank you! We too thought about winter spiders...but arachnids don't operate in the cold. Now we know. Just wanted to thank you for solving this webbed mystery (and source of household debate)! Ok... so why are we seeing it so much now? But never before? Ok. So why are we seeing this so much now? But never before. Cara, I don't know that we necessarily are seeing it more all of a sudden. For example, this post was actually put up two years ago. I haven't personally seen it since. It depends a lot on the different conditions in your specific area. Some years we see it a bunch, some years we don't.